You are, however, in this time of your life, exposed to many dangers; society is corrupt in the present day ; evil example is everywhere, and a thousand vanities entice the inexperienced traveller on life’s highway. There is one virtue specially calculated to preserve the innocence of the virgin heart — a virtue which, like a strongest wall, is designed to hold the enemy away. This virtue is modesty. It is one which must belong to the Christian maiden, and is a greater ornament to her than rich apparel, gold, and gems. If, dear young ladies, you desire to keep your heart free from filth, cultivate the virtue of modesty, the value of which I now wish to set before you. Modesty is exhibited in a composed and sedate demeanor; it regulates your exterior bearing and actions so that in your deportment there may be nothing for which you can be accused, nothing deserving of censure or rebuke, nothing contrary to our Christian profession. Modesty is practised by custody of the eyes and of the tongue, by quiet dress and unassuming manners. Let us first speak of modesty in regard to the eyes. Daily experience teaches us that bad thoughts and affections, which wage fierce and constant war against the the soul, are for the most part due to lack of custody of the eyes. There exists between the eyes and the intellect, between the intellect and the will and the affections, so close a connection, that a judgment is constantly formed upon the object perceived by the eyes and it is either desired or abhorred by the affections. Hence an object that is good will evoke good thoughts and a wholesome satisfaction; whereas an evil object will awaken bad thoughts and guilty pleasures. Then the eyes may be called the windows of the soul more so than the other senses, because through the eyes evil invade the heart. It is through the eyes principally that admission is given to vain imaginations, seductive images which arouse reprehensible thoughts, ideas of evil, and inspire desires. “Gaze not about upon another’s beauty,” says the Wise Man, “for many have perished by the beauty of a woman and thereby lust is enkindled as a fire.” “The fire arrows,” says St. Alphonsus, “that wound the chaste soul, and wound it perhaps mortally, find entrance through the eyes; one look may be like a spark of hell fire, that will prove its destruction.” In how many cases has freedom of the eyes been the means of corrupting the purity of the heart, disturbing the peace of the soul, causing fervour to grow cold, eventuating finally in Perdition! Dina, Jacob’s daughter, was a good and irreproachable young woman until one day, in spite of her father’s prohibition, she went out from the tents with thought of harm to see the women of the country. She saw and was seen, and had bitter cause to sad because of her curiosity. Many unhappy maidens, white as snow in regard to their virginal purity, have, in like manner, lost that treasure through one unguarded glance. The poison of immodesty has entered by the eyes — eyes once laughing and joyous in their innocence, now weeping over their lost virtue. For this reason all the saints observed custody of the eyes with jealous care. St. Bernard, after having been a year in the novitiate, was unable to say whether the roof of his cell was ceiled or vaulted ; St. Peter of Alcantara kept his eyes cast down so habitually, that he only knew of his fellow-monks by their voices when conversing with them; St. Aloysius, after living for two years in the court at Madrid, as one of the Empress’ pages, the angelic youth failed to recognize his royal mistress when he happened to meet her beyond the precincts of the palace. These servants of God were well aware that upon custody of the eyes depends custody of the heart, and that in order to keep their mind fixed upon God, it was indispensable to avoid every occasion of danger that might arise from the sense of sight. Wherefore, dear your ladies, keep your eyes under the guardianship of modesty. Remember that the devil never sleeps: he knows only too well how to avail himself of feminine failings, of the sensitiveness of a woman’s nature, of everything that will aid him in his work of destroying souls. Knowing that curiosity is a weakness common to the daughters of Eve, that their eyes naturally turn wherever there is anything fair to behold, he lays snares along their path to induce them to look, to gaze upon objects that are undesirable or suggestive of what is evil, in order that impure desires being awakened within the heart, the passions may be kindled, and the death of the soul become merely a question of time. And if the Christian maiden is to observe custody of the eyes at home, when walking in the streets, and in the company of others, still more should she be mindful to do so in church. The church is the house of prayer, the dwelling-place upon earth of the thrice-holy God, before whom cherubim and seraphim fall in lowly adoration. Mortals ought not to enter His presence without feelings of holy awe. Beware of letting your eyes wander there where all breathes recollection and sanctity. Beware lest you fall into the objectionable habit of looking at every one who comes in or goes out, of observing her dress or her carriage. Your demeanor should be modest, in keeping with the holy fear wherewith the sacredness of the place should inspire you; your eyes cast down, or fixed upon your prayer-book, or upon the altar where the divine mysteries are celebrated, or on the preacher should you be listening to a sermon. Irreverence in the house of God is reprehensible in every Christian, but doubly so in a Christian maiden, who, in custody of the eyes, ought to be an edifying example to one and all. But you are Christians, and the Christian maiden should remember that her body is holy, that it was cleansed in the laver of Baptism and made the temple of the Holy Ghost, that it has again and again been nourished with the body of the immaculate Son of God, that it is destined to rise again one day glorious and immortal. And while we behold the sacred body of the Redeemer bathed in blood, torn with scourges, and lacerated with thorns, will you strive to adorn your body according to all the foolish and ever-changing fashions of the world? Will you, who call yourselves the daughters of the Blessed Virgin, who was the model of all virtues and pre-eminently of holy modesty, outrage this virtue, so dear to her heart, by giving a great portion of your time and thoughts to the adornment of your person? I do not wish you to make yourselves singular, to abjure every kind of ornament: this your religion does not demand of you; it requires you to dress according to your state and condition in life, with simplicity, but in the manner that becomes a Christian maiden. What you are to avoid is ostentation and display, the affecting of the extremes of the fashion, and studying to be remarked upon rather for the elegance of your dress than for its suitability. Let modesty and decorum, therefore, be your rule in the adornment of your person. May you not be enslaved by them, nor let it be said of you that so poor a thing as the dress you wear engrosses your thoughts and your affections. Lastly, be modest in your deportment, your manner, your gestures, your every action. Would that you knew what dignity, what grace a grave and retiring bearing adds to a young woman. What dangers she will escape, what respect she will win, if she is quiet and composed in appearance, unassuming in conversation, gentle and reserved in her behavior, humble, affectionate, and modest in her doings with others! 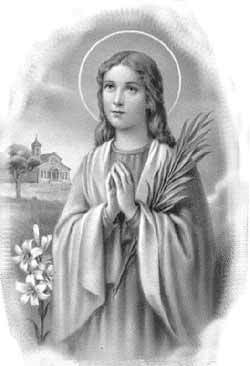 Ah, consider, dear young ladies, a saint and model of your life; the holy and blessed St. Maria Gorretti. She preferred holy purity to her own life. Rather death than sin. Cultivate to the utmost this precious virtue, the one for which our blessed Lady showed her predilection. Never let your eyes rest on any seductive or objectionable object; close your ears to conversation that would bring a blush to your cheek; let your speech be edifying and calculated to inspire others with the love of virtue. St. Paul exhorts us: “Let your modesty be known to all men,” in order that, appreciating and admiring it in you, they may be led to practise it. Be modest everywhere and with every one; you will thus resemble the angels and be one day admitted to their blessed company.